It is a dream for most of us to have high end mobile devices to combine many daily tasks and improve productivity. Undoubtedly iPhone is one of the best choices with seamless integration of software and hardware. As with everything, your iPhone may also respond slowly over the period of time and opening certain application like App Store may take considerably long time without any good reason. Here are some easy and crazy tips to improve the speed of your iPhone – try it out and let us know what worked out for you and provide your thoughts on comments if you have any other ideas. The first step is to check the available storage on your iPhone – ensure to have sufficient free space (at least 500MB) depending on the apps you use. The available space on your iPhone can be checked under “Settings > General > iPhone Storage”. You will see the category wise space occupied by various items like below. iOS will offer recommendations for cleaning up your phone. You can optimize photos by storing them in iCloud. Offload unused apps automatically when the iPhone is running short of space. In this option the documents and data in the apps will be kept in the storage. Once you reinstall the deleted app, the documents will be restored inside the app. Check the apps consuming more space. Touch the individual app and check whether you need to offload or complete delete the app based on the usage and need. When you delete and reinstall the app, all historical data (like chat history, media files, contacts etc.) will be deleted. But offloading the app will not delete the historical documents data. Hence delete the app only if you don’t need the data anymore. The size of the documents & data will grow based on the usage of the app. Here what you can do is simply delete the app by touching “Delete App” link and reinstall the app again. If you notice sluggish performance of Safari browser, go to “Settings > Safari > Advanced”. Touch on the “Website Data” section to see the size of data stored on the browser by the historical sites browsed by you. 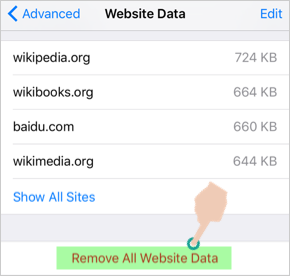 Touch on the “Remove All Website Data” to delete all website data and check the browser loads the pages fast. You can also use “Clear History and Website Data” option to delete all website files along with history. iPhone does not have default option to clean up the cached files in the memory and junk files on the phone. Check out the apps in App Store like “Battery Doctor” for finding and cleaning junk files in your phone. Most of the apps on your iPhone will get updates in the background and disturb the apps running in the frontend. You can simply disable background refresh of apps under “Settings > General > Background App Refresh”. If you would like to get updates for some of the apps in the background then you can only allow that app and disable all other apps. Notifications allow the apps to send popup and badge notices to inform you the updates. Though this is very useful it will slow down the phone when too too many apps trying to send notifications. Stop notifications under “Settings > Notifications” for all unnecessary apps. Possibly disable the notification previews by selecting “Never” option for “Show Previews“. Location services allow some of the apps to track your location and send the customized data. This will not only consume the battery but also slow down your iPhone. Easily disable location services for unnecessary apps under “Settings > Privacy > Location Services“. Remember enabling location services is mandatory for some of the tracking apps to work. In such a case, you can enable the service only for that app. Also you can enable the service only while using the app instead of always. Disable reduce motion under “Settings > General > Accessibility > Reduce Motion”. This will disable the graphical effects like parallax icons and improve the speed. Contrary to the opinion of keeping the iOS up to date, we strongly recommend not to upgrade the device immediately after the release of new updates. Basically waiting for few weeks of time to check the review of the release and then updating the device will save time and effort. Apple may release the bug fixes immediately especially after the bigger iOS releases, hence you can wait for sometime without any rush to update the operating system. You can check the available updates under “Settings > General Software Update“. Keep your apps updated to the latest version from App Store. The old apps may have speed and security problems slowing down the phone. Sometimes it is necessary to reset the iPhone based on your need. For example, if the network connection is not strong it is good idea to use “Reset Network Settings” option. 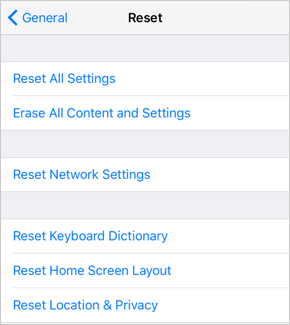 If the phone behaves like a snail, touch on the “Reset All Settings” to reset your iPhone to the factory default settings. Note the option “Reset All Settings” will only reset the apps without deleting any data. But the option “Erase All Content and Settings” will delete all the content on your iPhone. Ensure to have proper iTunes backup and other data backup before you do this action. You need to setup many things after reseting the iPhone. For example, you need the security password to connect to your preferred WiFi network after reset.